There’s a difference between saying you’re going to get healthier and actually getting healthier. Which side are you on? Do you have plans to start a walking or running routine? Does P90X sound like a formidable challenge? Are you going to go biking for 40+ miles this weekend? Work in Progress? Or just talking about it? Are you talking about what you’re going to do? Or are you actually doing it? If you’re really honest with yourself and you’re really just saying you’re going to do these things, then frankly you’re just a liar. Call it what it is. I’m no psychologist, but if you’re lying to yourself about that, where does it stop? There’s a lot of people who don’t have to say, “I’m going to start that exercise routine next week.” They’re already doing it! “I’m going to go get that bike tuned up and go out for 30 miles this weekend.” Their bike is already primed for the season, everything is ready to go. Those that say they want to be fit and in shape but aren’t committing to any exercise program are only kidding themselves. Believe me, they’re not kidding any of the rest of us. Am I talking to you? Or are you actually doing the work? It comes down to an honesty issue: are you gong to lie to yourself or are you going to commit and move to action? Are you willing to do the work and talk about what you’re doing or are you going to settle for talking about your plans for starting that workout next week? 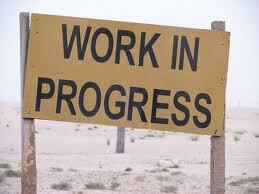 Is your health a work in progress or are you just talking about it? This entry was posted in Discipline, exercise on July 26, 2011 by Hans Schiefelbein. Thanks for reading Jeff. Health and fitness are my thing. If you ever need anything in that area please drop me a line. I’ve really enjoyed being introduced to your writing. Thanks for the inspiration. I hear you! A commitment to health shouldn’t be hard, but it is. We have all the excuses. What I have a hard time with is encouraging my loved ones to incorporate weight bearing exercises for bone health as they age and mixing up their routines. My mom works hard at her job and is exhausted at the end of the day, but she feels that’s enough for her. My mother-in-law plays tennis every week, but she’s so good that she hardly moves on the court and doesn’t break a sweat. Committing doesn’t have to mean boring. I love mixing up triathlon training with running races and weights…keeps the commitment interesting and fun. Nancy, what a great reflection. Moms are tough – you’re preaching to the choir here. I don’t mean this to be an excuse, but I’ve realized I have to be patient and let people discover physical activity and “strenuous exercise” when it’s right for them. Glad you’re digging the triathlons. Any other competitions this season?